KARACHI: A grand operation began in the early hours of Thursday, in Karachi’s Lyari area where a heavy contingent of Police and Frontier Constabulary personnel are taking action against criminal elements, DawnNews reported. Five people including police personnel were injured in the operation. CID SSP Chaudhary Aslam Khan was also present during the operation whereas for the first time a squad of the women’s police also took part in the operations. Law enforcement personnel faced resistance upon their arrival and blockades were placed at all entry and exit points of the area. 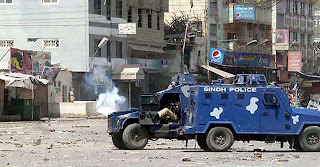 A Police armored personnel carrier (APC) came under grenade attack in Nawa Lane area of Lyari. No loss of life was reported in the attack. Loud explosions and firing were heard in Sango Lane, Cheel Chowk and Aath Chowk areas causing panic and fear to grip the area, leaving the residents of the area confined to their homes. In the light of the ongoing unrest, April 14′s board examinations of class nine which were re-scheduled for today were postponed again. The operations follows earlier events from Wednesday when a policeman was gunned during an exchange of fire with a suspected gangster and the killing of apolitical activist.